This has been quite a month of photographing, writing and posting and still catching up, and one of the major tasks I have been putting off is taking new photographs of art work and uploading them on the website. I have many pieces of art work and crafts for sale and the only thing holding me back at the moment is how they are presented. Decided to take a bit of time on this and next week it will be on the top of my list and I will give myself the time and space to focus. Started the course Hello Soul Hello Business earlier this month and it is really getting us to think about the what and the why of our businesses, and I have gained new insight into where I want it to go. In February I will be taking a break from the 30 day challenges, life can sometimes be one big challenge and need to just consolidate everything else that I am doing and get down to the meat of the course, and follow up on some of the things I unearthed over the past few months....also want to get back to some journalling, have been doing some as I have been clearing the clutter, will be sharing some of the pages soon. I also want to play around with some digital art, itching to start doing some work from Susan Tuttles book - Digital Expressions to see what I come up with. So with this it's good bye January, and hello February! Do share what will be new for you in February? Do you have a course or book you want to try? What makes you feel joyful? We can find it in what we do, there are some whose presence we can be around and we feel joy, we can find it in the simple things - the sun shining on our faces, the bird song, the cool breeze against our skin.. Make a commitment each day this week to experience Joy - look out for the miracles!. Today is a great day for starting over. What to do in my son's room, there are a few options, not sure he would appreciate all of them..though he would get the leg space he needs in this one! Well, what can I say, nearly the end of the challenge and I have been quite on it (for most of the time). 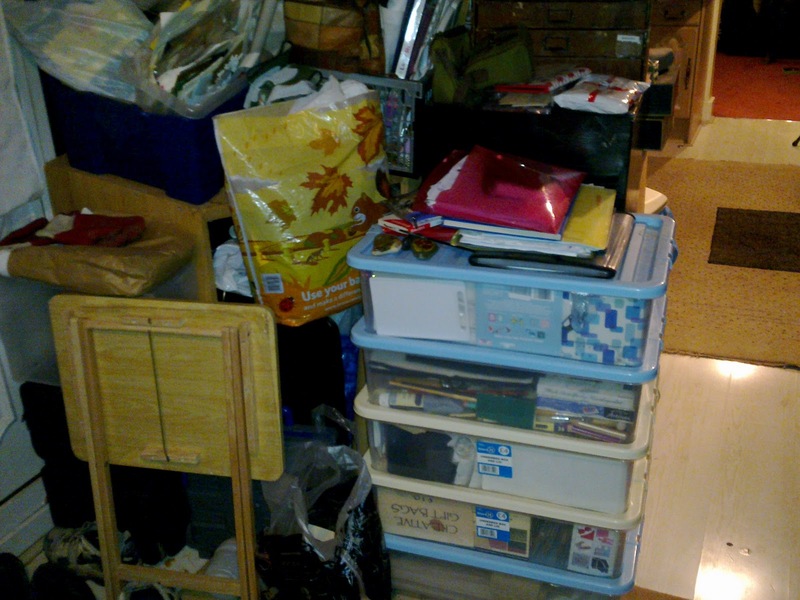 I know we all have that part of the house, or our space - somewhere that needs clearing, organising or just plain dumping. Wanting to make a fresh start and catch up with yourself. I have unearthed many delights I forgot I had. I will be posting for previous days to let you know how I got on. Its amazing what the wind can do, we have 2 New Zealand Cordyline australis palms in our garden I planted about 8/9 years ago, didn’t realise that we would be constantly picking up the fallen leaves, but they do look glorious in the summer with their lovely smelling flowers. When you open up the kitchen window you get a whiff.. The back of the garden got quite a bashing in the high winds. I have been thinking of converting the shed into an art space, at the moment it has a lot of things that also needs sorting, but thats for another day! The other thing that needs work is the plum tree, it should have been cut back at least 2 summers ago, so we will be cutting it back this year. Hopefully we'll get a better crop of plums, though the birds have fed off the ones we couldn't reach. Speaking of the birds I hung some fat balls, I love hearing them sing and thought I would take part in the RSPB big garden Birdwatch this weekend. It is an opportunity to see which ones are coming into the garden. The RSPB also suggest ways in which you can make your garden or space more bird and wildlife friendly. I am hoping to get some pictures of the birds that are our regular visitors, and may be inspired to get some ideas down for the shed come studio! What outside jobs have you been putting off? When was the last time you were really kind to yourself, treating yourself as you would a close friend? Do you appreciate yourself and show it, taking time out for you to recharge and renew your batteries. Sometimes because of what's going on around us we can leave ourselves till last. This week how can you make a point of taking even 5 minutes out of your schedule to reflect? My favourite reflection this week is Day 230, 'Time to wake up and smell the chocolate' - I love dark chocolate especially the 85% Cocoa one (and it's good for you!). The quote by Jeffrey David Lang, on Day 235 really spoke to me 'There will be times in life when impossibility is felt, but then there are dreams - and dreams allow us possibility. and is reminding me that I need to give my dreams the right foundations. And the scripture that will keep me is Day 236 from Psalm 139:5 - Thou has enclosed me behind and before, and laid Thy hand upon me. What area will you be focussing your time on this week? It’s time to wake up and smell the chocolate! Time to change your style! Step into the light and shine like the star you are. Nearly half way through the challenge and understand just how big a challenge I set myself. Want to make it as practical as possible so that I don't find myself being overwhelmed and lose interest along the way. Being flexible I understand the most important thing for me to do now is to for each area decide what needs to happen to it. I had half hoped to be super efficient and have all the areas locked down by the end of the month, but I have not been feeling it, and had lost enthusiasm, was change too bigger price to pay!! Rome wasn't built in a day, and my collection won't be cleared in a month but it can be better organised the Pottery Barn has some interesting 'schedule systems' ...little and often rather than all at once and fizzle out. How too when the cares of life come and weigh down on us we feel as if we need to solve the problem there and then, but often taking a fresh set of eyes, talking about it, looking at the possible benefits that may come out (lessons we can learn) then we can see the problem in a whole new way. I have got quite a lot so after going through them decided to use a lot more attachments to my paintings and journals, looking at ways to use more of it in my work especially some of the smaller pieces of work....I will also be using more in the journals and assemblage art that I would like to do. You can find some free printable ephemera at Sweetly Scrapped to get you started. I had seen some of Teesha Moores work and wanted to do some myself with the cuttings. I put them all in a large folder, and will separate them into categories to make them easier to find. Some of the images will go into my source book and I want to find a space to put my dream board. A virtual way of combining the images that I like as been the pinterest board. Do you have a dream board? Are you are on Pinteres? leave your details and we can have a look. The Filing cabinet is a Big Job. There are 3 draws filled to capacity and I will need to go through each section and get new file holders, get rid of files that don’t need to be there. I know that this was an area not for one day, but probably one week if not more. To start with I got plastic wallets and will look through files to see what could be dumped. I will also make sure that all loose filing is put away. I also found whilst going through the in-tray work that needed to be actioned, so will spend time doing this as well. It can be difficult not to drown in paper, there are some things you need to hold on to because of the legal requirements, and most people keep their certificates from birth, graduation etc. With the inside of the cabinets sorted the outside would also be great to change, and rather than the black wood to have some sort of design on them. Mandy P from Fabric Paper Glue has a great design that she put on one of her cabinets and also check out her pinterest for more great ideas, if your looking for a tutorial on how to change the look of your cabinets heres a handy one at Piccadilly Market . With the new technology it would be great to see how effective having everything computerised, but then you wouldn't have all that lovely ephemera to work with?? How long do you hold on to your paper work? Patience is something I prayed for, I was going through a trying time and finding the best solutions was a challenge. What I got in return were situations and events that would definitely try my patience, but what it also did was take me through and make me stronger. What was important for me was that I was not leaning on my own strength, but God, who showed me that he was making a way. I had to look at things differently and step out in faith. What have you been asking for that you realised you already had?